You might think that it would be neat to have a best friend who's writing a cookbook, and I suppose that it would be if you happened to live in the same town—or even in the same state—as she does. But I can tell you from my own misfortune personal experience that having a best friend who is writing a cookbook and lives on the other side of the country is absolutely no fun at all. Not only does she no longer have time to goof off on the phone have serious discussions about life, the universe, and everything with you because she's perpetually frazzled and frantically scrambling to make yet another deadline, but you can't even go over to her house and help devour the plates and platters of scrumptious food she cooks up every day in the name of work. Nope, you can only salivate along with everyone else in cyberspace as she taunts you with the offer of a free-for-the-asking gorgeous chocolate cake—that's 'pick-up at my house only' of course. And then there was the message she left on my answering machine one day saying, "I have buttercream frosting all over my hands and you don't!" If your evil pal best friend also happens to be a computer genius and is therefore your own personal tech support, things are even worse. Even I, computer challenged as I am, know that the new RAM she advised me to buy several months ago (which is now so old it's probably obsolete—or at least available at one-tenth of the price) would probably do a lot more good if it were actually in my computer rather than sitting on top of it. Besides having to starve not being able to indulge in all of her homemade gourmet goodness, I must also face the sad and frustrating truth that there isn't really any way to pitch in and get this annoying project finished already help her out because I'm a couple of thousand miles away. Even when she has a frightening run-in with a wasp, to which she is deathly allergic, and ends up spraying a counter full of food (and several hours worth of work) with toxic bug spray, all I can do is feebly try to console her over the phone. Once in a while, though, there does come an opportunity to save the day lend a long-distance helping hand, like when she calls and says she needs a few step-by-step photos of mixing up some ground lamb for her lamb burger recipe, and her market is totally lambless. No problem! you assure her as you head out to the covered porch off the kitchen, lift up the lid of one of your giant, ancient, jam packed chest freezers and pluck out a package of grass-fed ground lamb that you just happened to have raised yourself. And because helping your best friend out of a bind is of course its own reward, having to cook up and consume some lamb burgers that evening for dinner (since you've already gone to the trouble of mixing up the meat—and thankfully haven't had to douse it with bug spray) is just icing on the proverbial cake, especially if she happened to have told you once that lamb burgers on homemade rosemary focaccia 'buns' are delicious. So I guess having a best friend who's writing a cookbook isn't all bad. Now if only she would call and say she desperately needs a picture of some deep, dark chocolate cake batter—and buttercream frosting of course. After taking the required photos for Beth, I decided to apply my More, More, More philosophy to her original recipe and mixed some chopped fresh parsley and rosemary from the greenhouse into the meat. Oh, and I also added more shallots and garlic than she told me to, but hopefully she won't be able to tell in the photos. If I'd had any ripe heirloom tomatoes in the kitchen garden on the day I made these burgers, you can bet they would have been piled high with thick and juicy slices. But since it was still spring, I made due with some freshly picked arugula instead. As always, I urge you to seek out local and ingredients whenever possible; they really do make a difference. All natural, grass-fed lamb raised by small producers like us is becoming more and more readily available around the U.S., so there's no need to buy frozen lamb that has traveled halfway across the world. Search Local Harvest to find lamb and other food grown close to home. Place the ground lamb, feta cheese, shallots, garlic, rosemary, and parsley in a bowl. Sprinkle with salt and pepper, then gently mix until combined—the best way to do this is with your clean hands. Form into 3 or 4 patties. Place patties on a grill or in a hot skillet (cast iron works beautifully) and cook until brown, about 5 minutes. Flip burgers and cook until desired doneness. 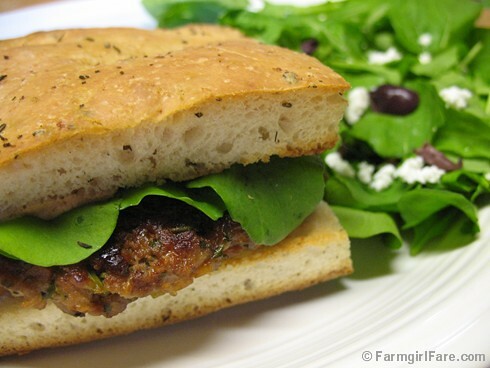 Serve between slices of focaccia or your favorite bread or buns. © FarmgirlFare.com, the burger loving foodie farm blog where Farmgirl Susan shares recipes, stories, & photos from her crazy country life on 240 remote Missouri acres. Want to see more pussycat pics? © Copyright 2008 FarmgirlFare.com, the award-winning blog where this was supposed to be a new recipe post (with accompanying story of course) but it isn't quite finished yet (what always takes so long? ), so we figured the least we could do was toss out a Daily Dose of Cute in the interim. And besides, the cats have been severely under-represented in the Daily Dose of Cute department—which is pretty bad since we have eight of them. Of course maybe if the Daily Doses of Cute actually appeared on a daily basis. . .
Want to see more collections of cat candids? Want to see more misty mornings? © Copyright 2008 FarmgirlFare.com, the award-winng blog where we always enjoy the morning mist (especially in summer since the moisture saves the fields when the rainstorms continually go around us), but the photos are deceiving — everything looks so crisp and cool, but actually it's hot and muggy. It is, however, as quiet as it looks. Unless Cary is complaining about something. Or the rooster is crowing ('cause they don't just do it at dawn). Or Bear and Robin are barking. Or one of the hens is laying an egg. Or, god forbid, Donkey Doodle Dandy is upset. Okay, so maybe it's not so quiet around here after all. But at least this is the kind of noise we don't mind hearing! © Copyright 2008 FarmgirlFare.com, the award-winning blog where the skittish lizards don't do much leaping this time of year — but they don't do a whole lot of sitting still for pictures either. Of course their skittishness may be caused by the fact that a certain little kit kat keeps catching them and bringing them into The Shack — alive but usually tailless. Back in May I created an easy orange yogurt loaf cake specifically to enjoy with the beautiful ripe strawberries that were in my kitchen garden. I quickly became addicted to both the cake and the combination, but what I didn't realize at the time was that this cake was actually made for blueberries. Oh yes. Oh yum. © Copyright 2008 FarmgirlFare.com, the award-winning blog where it is indeed possible to polish off an entire gallon of local blueberries (along with a fair amount of orange yogurt cake) by yourself in about a week. Urp. (But think of all those antioxidants!) And one of these days we'll get around to actually baking a blueberry pie instead of just thinking about it. Anybody have a good recipe - or another favorite way to use blueberries? © Copyright 2008 FarmgirlFare.com, the award-winning blog where Esmeralda (who was just 6 days old when this photo was taken back on July 12th) is 100% donkey but has turned into quite the little attention hound. And yes, a baby donkey who runs right over whenever she sees you and can't get enough hugs and cuddles is definitely cause for some serious cute overload around here. Apparently the only thing it takes me longer to get around to doing on this blog besides announcing a book giveaway contest is announcing the winners of the contest (which, in this case, I randomly picked ages ago). So finally, congratulations to Barb and Tina F! You've each won a hardcover copy of Comfort Food and a handy dandy canvas totebag adorned with the beautiful book cover artwork. In her entry comment Tina wrote: My favorite comfort food would probably be pasta. Clam spaghetti like my husband makes it or pasta carbonara. With a nice rich ice cream for dessert! And Barb said: Just reading the comments made me think, Yeah! That could be a favorite comfort food for me, too!, but I think my hands-down favorite comfort food would have to be a slice (only one???) of freshly-baked, homemade bread. Is there anything on earth better than that? Ladies, if you'll email me your mailing addresses (farmgirlfare AT gmail DOT com) I'll send you your prizes. This was definitely the most entertaining contest I've held so far. Nearly 250 of you took the time to tell us about your favorite comfort foods, and some of you even shared recipes (thank you!). During the contest my mother sent me an e-mail message with the subject line of 209 comments!!!! and then wrote: Did a lot of people just want to talk about comfort food or really want to win the book? I jokingly replied that it must be the totebag, but I do think she was onto something. I know that I never get tired of talking about comfort food. As I mentioned before, I really enjoyed this book. And the audio version read by the amazing Barbaba Rosenblat is absolutely wonderful. 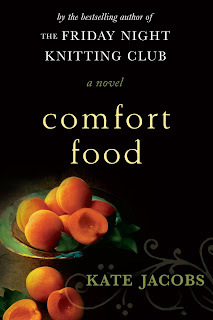 While I was in the middle of listening to it I learned that Kate Jacobs' first novel, The Friday Night Knitting Club, is being made into a movie starring and produced by Julia Roberts, and I immediately realized what a fantastic movie Comfort Food could be. With the right cast and screenplay, I think it even has the potential to surpass my current favorite food movie (and one of my all time favorite films), Mostly Martha. Hopefully I'll have a chance to find out. Many thanks to all of you who took part in the contest. I have several more fun foodie book giveaways planned so stay tuned. I'm sure I'll get around to announcing them one of these days. And my apologies to those of you in other countries who aren't able to participate in the contests, but I checked on some international postage rates and unfortunately it often costs more to mail the books than the books themselves cost! © Copyright 2008 FarmgirlFare.com, the award-winning blog where we believe the only thing better than discovering a wonderful new book is sharing your discovery with fellow book lovers. That's One Happy Little Dog! Want to get to know Robin better? 11/13/05: We Have Llama Contact! 11/20/06: It's Monday Morning. Wake Up! 11/24/06: Ear Flaps Up? Check. © Copyright 2008 FarmgirlFare.com, the award-winning blog where, at nearly 12 years old, everybody's favorite beagle (well, except for that other one) may not be the mighty squirrel hunter and armadillo killer she once was, but she still enjoys the heck out of every minute—and we know that each day we have with her is precious.